I have not been able to devote as much time as I would like to working on 16-Bit Tactics lately, but I have still managed some progress. Right here is a pic of the current format, such as it is. I've been toying with a few ways to set things up and it's surprising to me how time consuming it all is. Ultimately it should be worth it to hammer out a decent format now rather than having a good idea later and needing to redo the entire thing. For those following along at home there are two rules changes that you can see with this new Job sheet. First is that DEF/M.Def is now part of your current job rather than based on your current armor. Second is the addition of M.Eva. The additive stats have been reformatted so that it's plain to see which things get added per level and which stay the same across levels. We will be keeping some form of the high/low threat rule for fighting creatures of much higher or lower level. With defenses and evasions now baked into Job, it will be much easier to word things as well. If you squint you should be able to make out that Battle Tech includes 3 types of things: 5 weapon attacks, 1 self buff, and 1 unarmed attack. Weapon attacks are the largest subset of melee attacks. They use the normal rules. 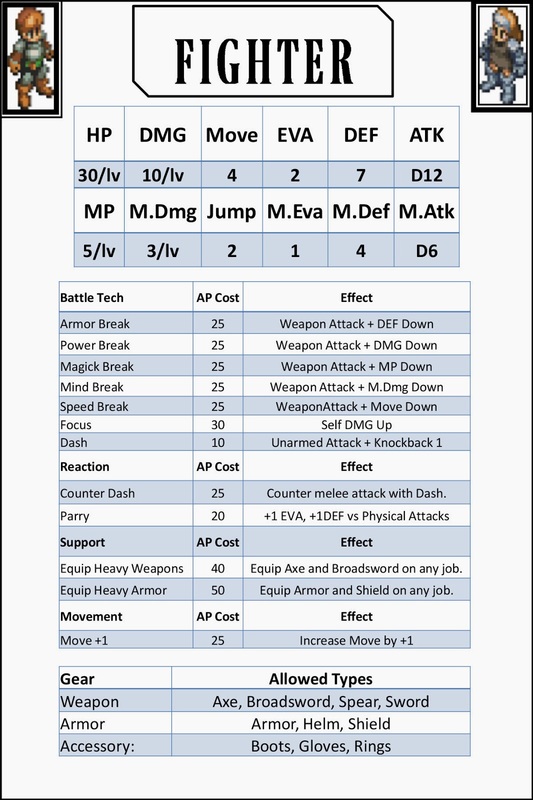 Since the generic Fight command is a weapon attack, this means that once a Fighter has learned any one of the 5 special attacks they have very little use for basic attacks. Unarmed attacks are another subset of attacks. They work just like weapon attacks except you do not add any of the stats for your equipped weapon(s). Mostly this means you don't add its DMG bonus to your hits, but it would also ignore any elemental or status effects provided by the weapon. Buffs are a type of status effect. The effects themselves are standardized and they do not stack with themselves. So the DMG Up status granted by Focus would not combine with other affects that also grant DMG Up such as the Bravery spell. They do, however, stack with Support abilities that give the same effect as those abilities essentially change the character's base stats rather than giving a status effect. Just as a character has 5 slots for abilities, they also have 5 slots for equipable items. The mini table at the bottom of the Job sheet shows which items can be used. Unless an ability says otherwise, a character should only have at most one head, one body, one weapon and one shield equipped. Equipping two weapons (or a single, two-handed weapon) additionally precludes using a shield. For accessories the main limitation is that only one of each kind can be used. So you could have both boots and gloves, but not two gloves.